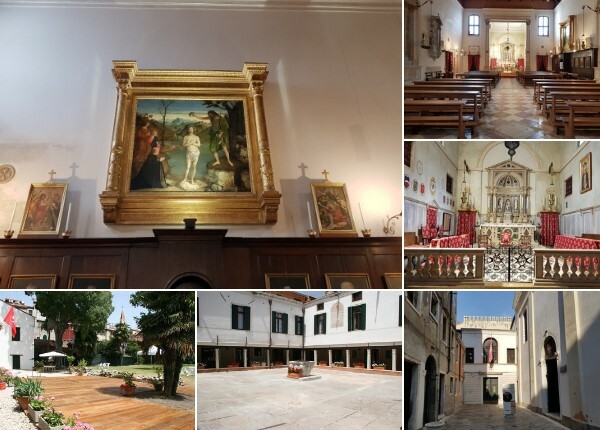 If you are near Castello, Calle dei Furlani, don’t miss the opportunity to visit the church of San Giovanni Battista of the Order of Malta. The church of San Giovanni Battista is a church that has given hospitality to two different chivalric orders: Knights Templars and Knights Hospitalers. The Church was referred to over the centuries as the church of San Giovanni during the time of the Knights Templars, Giovanni Battista during the Knights Hospitallers, but by Venetians as the Church of San Giovanni dei Furlani, due to the large presence of the community from Friuli in this area. The present complex goes back to the restoration works carried out by the Grand Master Sebastiano Michiel between 1498 and 1505. The church had originally seven altars, in 1498 these were reduced to five and in 1806 during the time of Napoleon the church was stripped of all of them and used as theatre. When the Austrians repossessed Venice the church was redecorated with three altars coming from the storehouse of the State Property of Santa Margherita. Giovanni Bellini painted for this church the altar piece depicting the baptism of Jesus and close to him the commissioner of the painting, the Grand Master Sebastiano Michiel in 1500.